Inanna, wearing a multi-horned crown stands with her head in the realm of the deities and their devotees. Her bird-clawed feet rest in the underworld, inhabited by strange and demonic creatures. Mesopotamian cylinder seal, 2000-1600 B.C. The Sumerian poem, The Descent of Inanna (c. 1900-1600 BCE) chronicles the great goddess and Queen of Heaven Inanna’s journey from heaven, to earth, to the underworld to visit her recently widowed sister Ereshkigal, Queen of the Dead. This entry was posted in Ancient Texts and tagged Anunnaki, Sumer on March 9, 2016 by ZSI. 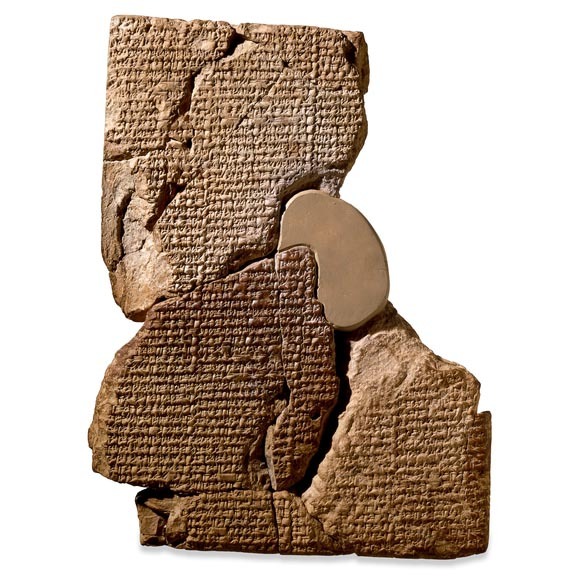 1-9 After Enlil’s frown had slain Kic as if it were the Bull of Heaven, had slaughtered the house of the land of Unug in the dust as if it were a mighty bull, and then Enlil had given the rulership and kingship from the south as far as the highlands to Sargon, king of Agade — at that time, holy Inana established the sanctuary of Agade as her celebrated woman’s domain; she set up her throne in Ulmac. 10-24 Like a young man building a house for the first time, like a girl establishing a woman’s domain, holy Inana did not sleep as she ensured that the warehouses would be provisioned; that dwellings would be founded in the city; that its people would eat splendid food; that its people would drink splendid beverages; that those bathed for holidays would rejoice in the courtyards; that the people would throng the places of celebration; that acquaintances would dine together; that foreigners would cruise about like unusual birds in the sky; that even Marhaci would be re-entered on the tribute rolls; that monkeys, mighty elephants, water buffalo, exotic animals, as well as thoroughbred dogs, lions, mountain ibexes (some mss. have instead: mountain beasts (?)) (some mss. have instead: horses), and alum sheep with long wool would jostle each other in the public squares. This entry was posted in Ancient Texts and tagged Lamentation texts, Sumer on February 16, 2015 by ZSI. The Myth of Adapa (also known as Adapa and the Food of Life) is the Mesopotamian story of the Fall of Man in that it explains why human beings are mortal. The god of wisdom, Ea, creates the first man, Adapa, and endows him with great intelligence and wisdom but not with immortality, and when immortality is offered Adapa by the great god Anu, Ea tricks Adapa into refusing the gift. This entry was posted in Ancient Texts and tagged Adam, Adapa, Anunnaki, Sumer on February 7, 2015 by ZSI. Adapa, the first man, was created by the Mesopotamian God Ea. Below is a translation of an artifact that was translated by Stephanie Dalley in which man is created. Sitchin died hoping the DNA of queen Puabi could prove his theories right. This is one of the last statements made by Dr. Zecharia Sitchin (1920-2010), one of the best known researchers of the Sumerian clay tablets. Dr. Sitchin devoted over 30 years of his life to studying these tablets, and developed the theory about the Anunnaki and planet Nibiru. According to this theory, an alien race called the “Anunnaki” arrived to the Earth more than 5000 years ago and created humans through a genetic experiment. This entry was posted in Interviews and tagged Alien DNA, Anunnaki, Interviews, Nibiru, Sumer on February 6, 2015 by ZSI.